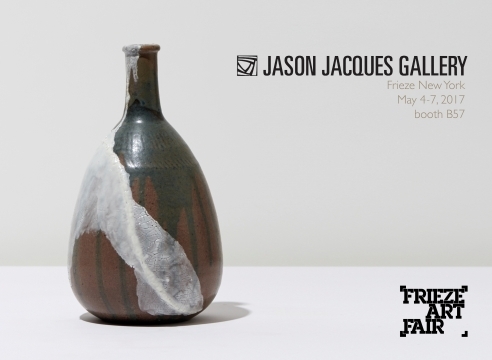 The large-scale leaf-like sides of this jug highlight the main body of the piece and point towards the depth of color used throughout the jug. 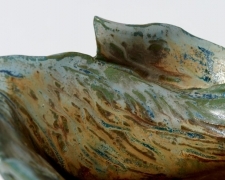 The leaf-like features and stone are intricately scored and painted with various layers of color, with striations of blue on top of the green of the leaves, pink pools near the yellow-orange base color. 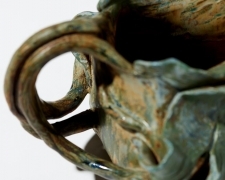 The three strand handle juts off the back of the jug and the two outermost strands divert left and right, respectively, into the leaf-like side. 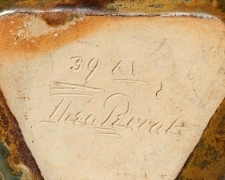 Marks: Signature incised "Theo Perrot 39 XI."